As I’m sure you will know, the new Library of Birmingham opened yesterday, amid much press fanfare and a lovely opening speech by Malala Yousafzai, the text of which you can read here. 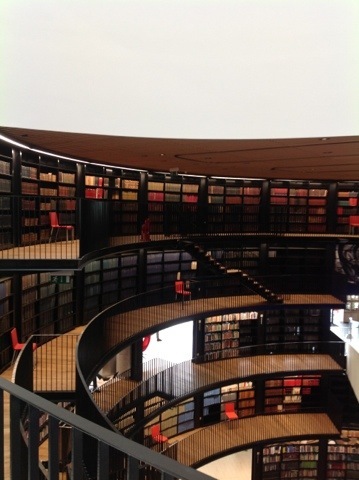 I am partial to a good library, so I went along to have a look, and I must admit I was impressed. I spent many hours in the old library, and the contrast is amazing: the light and open space of this library is remarkable, and I hope will prove inspiring to those who visit it. Spread across nine floors, the Library is reaching for the sky, both metaphorically and literally. The view from the terrace is wonderful, and the design on the outside casts beautiful shadows across the interior. The building is a great example of what a library might be: focused on books but also on learning and culture in a wider sense, perhaps aided by the building’s incorporation of the Rep Theatre. The children’s section includes ‘Middle Earth’, as well as a Chill-out Lounge and Beatbox, while upper floors include an art gallery and film-viewing booths, as well as a café and the Shakespeare Memorial Room, reconstructed to match the original room with elaborate ornamentation, and a fascinating range of Shakespearean collections. 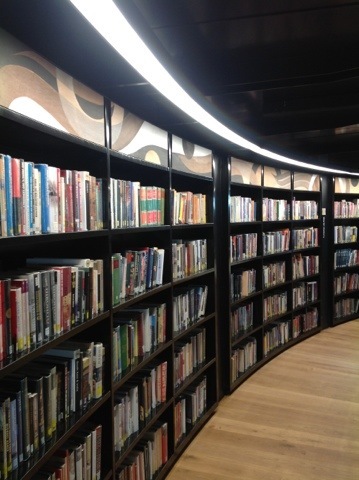 The Library is running a great range of events to make the most of their remarkable facilities. Of course, the crucial question is what it will be like as a space in which to study, research and write. The reference collections there are good, and I often recommended students to visit the old library for this reason, and with the help of the floor plan and the online catalogue it shouldn’t be difficult to find things. The spaces for study include private rooms and public tables, as well as the balcony where one can read and relax, and I am looking forward to returning. Birmingham has for so long had a bad reputation, for a lack of culture (quite undeserved, with the Rep and other theatres, Symphony Hall and other concert venues, the Museum and Art Gallery, and of course several universities) but this Library should show how serious Birmingham is about learning and culture. It is a monument to the benefits of culture, just as the Victorian museums and other public buildings were – a statement of intent from the council and people of Birmingham that a high priority should be placed on the education, culture and pleasure of the inhabitants. It is also even more significant: Malala said in her speech that world peace can be developed through reading; books are a weapon in the war against terrorism. The more one reads, the more one understands, and Malala is right: through books lie the path to mutual, cross-cultural understanding. Nice library! What are the tile things at the top? It is, isn’t it? Do you mean the circles? 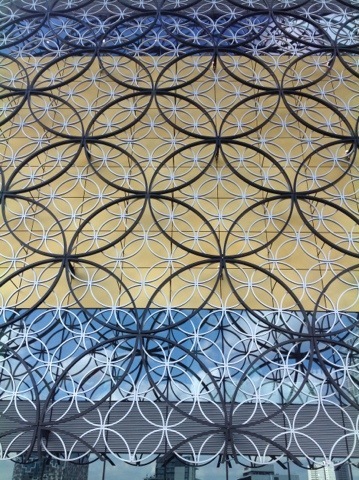 That’s the pattern on the outside – inspired by Birmingham’s jewellery making heritage. Ah! It’s funny, it seems to have an Islamic/mathematical theme about it. I like Birmingham. Went there twice as my husband’s business used to run a conference/event thing there. That was over ten years ago..it struck me as very modern there. Apart from the Bullring place, which had its own charm. Yes, I can see that. I think it’s meant to reflect all kinds of cultural things. Birmingham has changed a lot – when I first moved there the Bullring was very different, all markets and a bit rundown, though I was quite fond of it. I’m not very keen on shopping centres so I think I preferred it before! I think that was when I knew it, with markets. I remember my husband going to an old fashioned barber’s around the back. Yes, that would be up by Victoria Square, I think, near the art gallery and the old library. I don’t think that much has changed there apart from the refurbishment of the Town Hall as a concert venue.